All was well with the Zari-Diamond project until Sep 19 when the 27 year old bongo flava star came out to tell his baby mama, he had not only cheated on her with a video vixen, but she also became pregnant in the process. 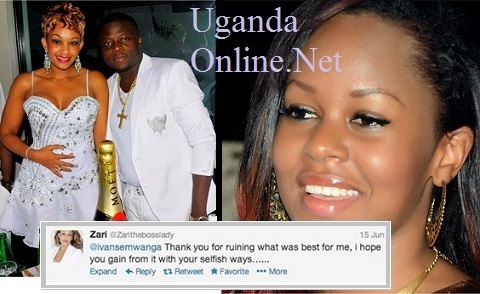 With Zari you don't get off scot-free considering this is a lot worse than what her late ex-husband Ivan Semwanga did. Zari and the late Ivan had been together for ten years and were blessed with three wonderful sons. At the time, Zari discovered her late husband was having a thing or two with Sharon O who represented Uganda in Big Brother Africa back then, these were the words that followed; "Ivan, Thank you for ruining what was best for me, I hope you gain from it with your selfish ways…..."
Zari went on rampage and started dating openly with any hunk that crossed her path. She started off with basketball star Isaac Lugudde aka LK4, an initial she tattooed around her privates just to teach him a lesson. That 'LK4' tattoo was soon replaced after the basket-ball star had been dumped for yet another lad, Farouk Sempala, better known as the muscle man, he also left his mark after feeling the tattoo area and showering it with so much love, unfortunately for him, his tenure was so short lived as the East African project very quickly came into play. 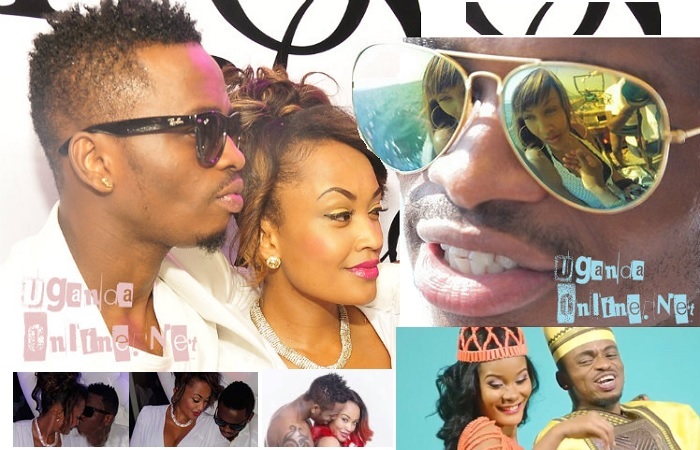 Zari and Platnumz met on a plane, they actually sat together and by the time they were done with the flight, East Africa was yet to receive the project that came to be. In all this, Ivan was reduced to binge drinking as a way of dealing with the whole situation, the same drinking caused his death early this year after he hit his head on a hard object. The operation to remove a tumor from his head was not successful. During his funeral, Zari told mourners of how she had moved on to another relationship, but Ivan hadn't. 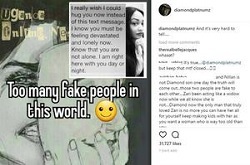 When Zari chose to move to Diamond Platnumz, Ivan told her that I will be waiting for you, but as fate could have it, Ivan is long gone and now, Diamond is having it his way. It should now not come as a surprise to see Zari visiting her late husband's grave every now and then, she misses him and in spite of his wrongs, he never got to this extent. And now, another Big Brother star, Dilish Matthews, is being cited in the complex web at the time when Diamond was forced to take responsibility for his actions by Hamisa Mobetto. The signs are on already as she narrates here; Why cry for Diamond Platnumz, my bank balance is intact-Zari. Two of her sisters are on crossroads here, one sides with her moving on while the other advises her to hang on in there, but they were quick to remind her as to why she did not advise her big sister to remain with Ivan who did so much for them as a family as opposed to the musician who has literally done nothing for Zari.